What Is the Function of Starch? A type of complex carbohydrate, starch is found in a wide range of foods, including potatoes and whole grains. Starch breaks down into glucose in your body, providing a more gradual energy source for your bodily processes than do simple carbohydrates, such as refined sugar. Carbohydrates, such as starches, provide the majority of fuel for your body, so it makes up a significant part of your caloric intake. Starch breaks down into glucose in your body, providing a more gradual energy source for your bodily processes than do simple carbohydrates, such as refined sugar. In terms of dietary function, the only purpose of starch is to change into glucose to be used as energy for your body. Glucose is the usable form of carbohydrate for your body. Glucose circulates throughout your body in your bloodstream, and gets taken up by cells and used as a source of fuel. Glucose is used to power all of your bodily functions, and it's the main source of energy for your brain and nervous system. While most starches are broken down by your body into glucose, some starches, known as resistant starches, pass undigested into your colon. These starches function much like dietary fiber. They provide nutrition for the beneficial bacteria in your colon, keeping them thriving and healthy. 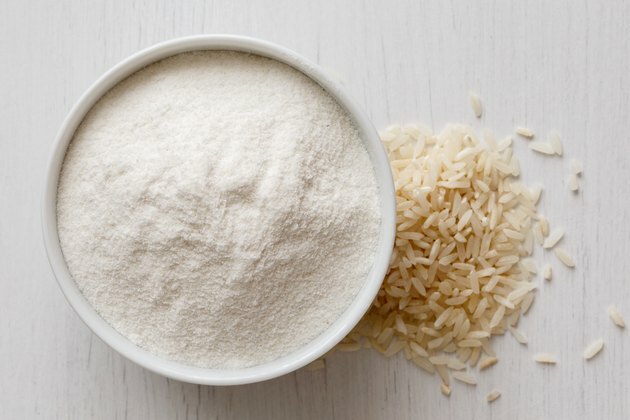 There are four types of resistant starch. The first is found inside the indigestible cell walls of plants; the second is considered indigestible unless it is heated; the third is sometimes called retrograded starch, as long cooking times followed by a cooling period make them more difficult to digest; and the last is industrial resistant starch. This last type of starch is chemically modified and is not a natural starch. Starch-heavy foods include legumes; starchy vegetables, such as potatoes; and whole grains, including whole grain products such as breads and cereals. These foods are also rich in a range of essential vitamins and minerals, which are important for overall health. Foods high in resistant starch include raw potatoes, green bananas and plantains. Potatoes, rice and legumes that have been cooked for long periods then left to cool are also high in resistant starch. Legumes, starchy vegetables and whole grains are also naturally high in dietary fiber. Dietary fiber can help lower your blood cholesterol level, as well as reduce the effects of constipation, hemorrhoids and diverticulosis. Most Americans do not consume enough dietary fiber on a daily basis. Carbohydrates should make up 45 to 65 percent of your total calorie intake each day. For a 2,000-calorie-per-day diet, that translates to between 225 to 325 grams of carbs per day. The National Health Service states that to get enough glucose in your diet from starch, one-third of your total food intake needs to come from starch-heavy foods. However, the dietary recommendations differ according to your personal health. If you suffer from diabetes or are overweight, consult a doctor for specific advice. What Are Two Major Kinds of Complex Carbohydrates? One Gram of Carbohydrates Has How Many Calories?